I have been out searching for more Jeep Off Roading clubs around the United States. As I find them, I will continue to post them here so if you live in the area of one of the clubs and don’t already belong, you can be informed of what is around you. Often times Jeep Off-Road clubs have their own special events, (like ones I have posted about in the past) where anyone can partake in and with summer coming and looking to plan a little vacation time, connecting with another club is a great way to connect with other likeminded people if you care to venture in their direction. In my search to bring various Jeep Clubs to the forefront I came across the Mile-Hi Jeep Club of Colorado. The following is information from their website and their contact information if you are interested in attending their upcoming event – 2010 All-4-Fun in Silverton, Colorado being held July 31, 2010 thru August 7, 2010. What a great mission statement! Way to go Mile Hi! Coming soon is the Mile Hi Jeep Club’s 44th annual All-4-Fun Week in Silverton, Colorado (July 31, 2010 thru August 7, 2010). From what I read, there is still time to register for this event if you are interested, but spots are filling up fast so jump on this quick if you are going to be out that way! The Mile-Hi Jeep Club and the 2010 All-4-Fun Committee are happy to announce our 44th annual All-4-Fun Week. 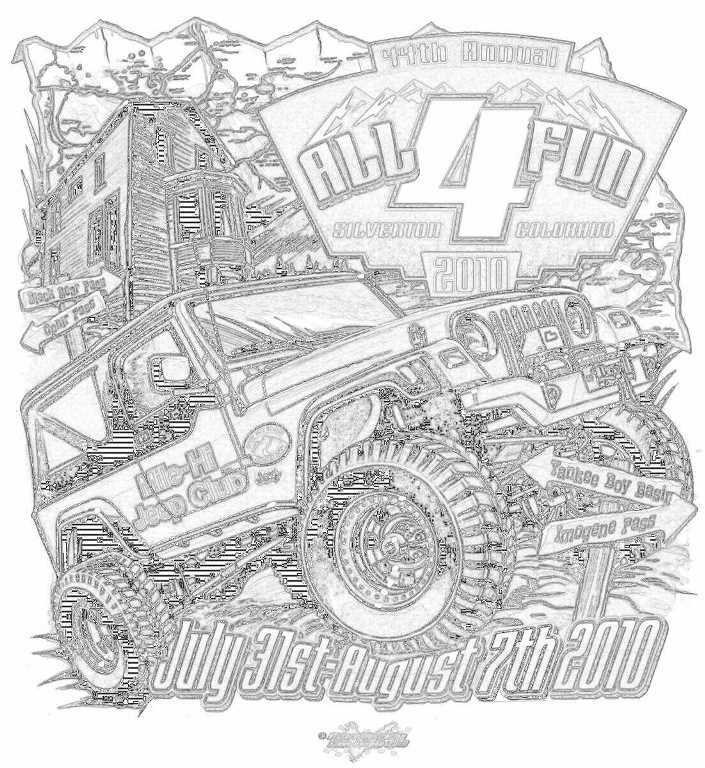 This year’s event will be held July 31, 2010 thru August 7, 2010 in Silverton, Colorado All-4-Fun is a family oriented 4-wheel-drive adventure. Nightly activities (included with your registration fee) include, but are not limited to, multiple meals, an ice cream social, karaoke and games. We have support from many manufacturers and vendors from across the country including, WARN, Bestop, Daystar, Clemson 4 Wheel Center, Goodyear, 4 Wheel Parts, 4 Wheel Drive Hardware, Big O Tires, and High Country Performance just to name a few. These and other sponsoring companies contribute to the nightly entertainment as well as provide tremendous prizes. If you desire to participate as a vendor or prize contributor, please contact the All-4-Fun Promotions Committee at rockjox@jamcscorp.com. The tremendous support we continue to receive from manufacturers and vendors has allowed All-4-Fun to make donations in the past to Children’s Hospital and many Colorado land use projects in excess of $150,000. Camping space will be available for your camp vehicle or tent within our unprepared campground. We will provide portable latrines and access to potable water; you must be self-sufficient. There are no electric, water or sewer hook-ups. The 2010 All-4-Fun registration fees are as follows. For one registered vehicle and driver, $300.00 (any number of licensed drivers may drive the vehicle but only one person can be designated as the “registered” driver). Passengers eighteen years of age and up are an additional $50.00. Passengers five through seventeen years of age are $25.00. Passengers under 5 years of age are free. A check or money order for the full registration fee must accompany your registration. Registration fees are refundable if a written request is received by June 30, 2010. For accounting purposes, refunds will not be disbursed until after the 2010 All-4-Fun event. No exceptions will be made for refund requests after June 30, 2010. All attendees must be pre-registered. NO on-site registration will be accepted. Due to the limited amount of space for camping, registration for the 2010 All-4-Fun event IS LIMITED to 225 Vehicles. In mid to late spring, we will mail or email to registered participants additional information including road directions and a pre-sale order form for T-shirts and sweatshirts. Upon arrival at All-4-Fun, participants are required to sign a hold-harmless agreement. All vehicles must be licensed and insured to drive on federal, state, and county roads in Colorado.